Introduced in the early 1960s and firstly issued to the British Special Forces only, the British DPM camouflage is one of the most known and recognisable camo patterns worldwide. Being used by many armies across the world, particularly in the former British colonies, it has been initially adapted by the British Army for its range of combat uniforms, field jackets and parkas, as well as for webbing, packs and rucksacks. Although since its introduction till the year 2000, the DPM camo (short from the 'Disruptive Pattern Material') underwent some changes in the pattern scale and colouring, it remains a four-colour camouflage which uses a basic western European temperate colours of black, dark brown, mid-green and a dark sand, being very effective in the most of woodland environments. Moreover most of the current DPM equipment is IRR coated which reduces the visibility of soldiers to night vision devices as trees and other green plants reflect deep red and infra-red light. 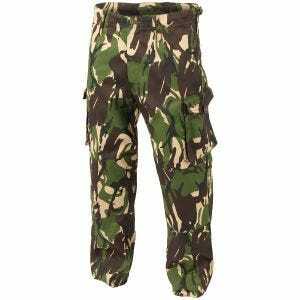 For all its customers, Airsoft, Hunting and Paintball enthusiasts, the Military 1st online storeoffers wide range of clothing and accessories in this classic camouflage, including army style combat shirts and tactical cargo trousers.